Do you want to have a Website like this ? Please email us here ! Want to get an Overview of this Website ? Visit my Review-Catalog ! Don't forget to visit also my Video-Reviews ! Questions ? Ask me ! 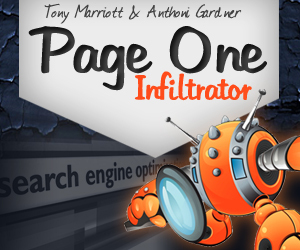 The Page One Infiltrator has been created by Tony Marriott and Anthoni Gardner and is an amazing piece of software, which gives you exactly the directions to rank any of your websites high in the search engines. It is specialized on the seach engines Google, Yahoo and Bing with all their country specific sites. Thanks to Tony and Anthoni I got a review copy and so I can provide you an in-depth review of this software. The results from Page One Infiltrator are based on the latest informations and algorithms of the search engines, especially they cover all latest updates from Google, like Panda or Penguin. You can follow these results also in the future, regardless which animal Google will create. You will get a bunch of clearly structured informations about any of your websites, which will be vital to have success with your search rankings. The whole Page One Infiltrator software is based on Adobe Air and so it is independent whether you have a PC or MAC. In the case you haven’t installed Adobe Air yet, the download of Adobe Air is also provided within the installation of Page One Infiltrator. It is fully automated and everyone even without any technical skills can do it. The system is structured into projects, which means, that every website you want to analyze, in an own project. You simply type in the URL of your website, the keyword you want to rank for and the search engine where you want to rank (e.g. goole.com, google.co.uk, bing.de and so on). Then this project will be saved and with one click you will make the system run. All you need to do now is only to wait a little. Page One Infiltrator collects now the data of all top-ranking websites for your keyword and calculates several values for a bunch of important ranking points. Same time it also calculates all these values also for your given website. The result of this will be a minimum and a maximum value for each ranking point and an average. But this is only the start of the system, because only to give you some values would be too complicated for you. The system analyzes almost everything what you need for a good ranking. This is e.g. the readability of a website, the seo link analysis, the social signs, the page load speed and much more. After all these calculations you get a comprehensive report for you website (HTML and PDF), which not only includes all these results in numbers. It is exactly explained, what each result is going to tell you and you get an exact blueprint how to increase several ranking points of your website. Readability: The readability of your web page must be easy enough to suit a wide range of people and educational ability but the content must engage, interest and show authority. Keyword In H1 Tags: The H1 that is the “highest” header level as defined in the HTML code (i.e. <h1>Your Page Header</h1>). The result is the amount of times the primary keyword (keyphrase) and any sub keywords are found within H1 tags. Keyword In Domain Name: The result is the number of primary keywords and any short tail keywords that are found in the actual top level domain name of the listed sites. Keyword In Page URL: The page URL is the full url to the actual webpage. (i.e. yoursite.com/pagename.html). The result reports the number of times the primary and short tailed keywords are found in the URL. Social Networking: This result is the number of times the sites are referenced at the some of the key social networking sites. Page Load Speed: Page load speed is a measure of the time taken for the host server to fully present the web page. Page load speed can be affected by many factors. Keyword In Header Tags: HTML header tags range from H1 down to H6. The result is about the number of times the primary and short tail keywords appear between the H2-H6 header tags in the page HTML code. Keyword In Image Filename: Here we talk about the number of times the primary and short tailed keywords are found in the image source url or image file name. Site Popularity: The site popularity measure is an estimate of site traffic. Note this measure is at a site level not a web page level. However sites with a lot of traffic are seen by google as popular and hence will likely receive a boost in their overall rankings. The rankings of inner pages may also gain advantage. Keyword In Outbound Link Text: Having your Keyword placed in your outgoing anchor text will allow search engines to associate your page with that Keyword and will also give it more contexual weight. Site Hierarchy Depth: It is likely that, all things being equal that Google will give additional ranking power to those web pages that are nearer the top level domain. Web Pages buried deep in the folder structure may suffer. Keyword In First Sentence: Here we analyse the number of primary and short tail keywords found within the first sentence of the web page body text. Keyword In HTML Comments: Here you will find listed the number of primary and short tail keywords found within the HTML comments on each web page. Keyword In Body Text: This section displays the numbers of primary keywords (key phrases) and short tail keywords found in the web pages visible body text. SEO Link Analysis: This part supplies an overview of the backlinks and quality of backlinks to each page. There are number of different measures in this module. Tabular Keyword Count: The total keyword count is the number of keywords that appear across the whole web page HTML source code. Table Word Count: Having good content on a web page is the heart of any good SEO. Displays the total number of words found within the textual content of each web page. Table Character Count: This part is about the total number of characters found within the textual content of each web page. This report is not only a light collection of some phrases, just the opposite: one report contains about 50 pages (!! ), is clearly structured and everything is excellently explained in details (also with grids). It is exactly shows you, where your website is better than the competition (remember: we speak about the top-ranking sites for your given keyword) and where you need to do some corrections and improvement and even which! Are you intended to get free and high targeted traffic from search engines ? Maybe a big part of your business is dependent on this ? Then I highly, highly recommend you Page One Infiltrator. You will get nothing better and same time more affordable, period! You will not need to invest monthly payments into other systems, where you are limited inyour work. With Page One Infiltrator you will have your own system in the house, where you can make your analysis whenever you want and how often you want. This software is the best investment you will make for your business! FINALLY a product, which does not need any hype to be well accepted. Maybe you will ask now, if Page One Infiltrator will make you money ? If your business needs best rankings in the search engines, this software will put your business into the next next level, believe me. Sure, the software doesn’t make money directly on the first sight, but it gives your websites this huge shot to the top of the search engines, which can result in a boatload of money. You don’t need to be the best in any point to get an amazing ranking. But if you will try to optimize your on-page and off-page SEO according to this analysis in as many points as you can, the ranking results of your websites will take your breath! Last but not least I want to give you an additional idea, where you can earn money with this software even DIRECTLY. What’s about using Page One Infiltrator to establish an own SEO-business? You can make analysis for offline clients, who want to know how to rank their site for their keywords (and more important: WHY don’t their sites rank so well). At launch time this commcercial license is reduced to the price of the license for personal use – both versions cost 47$ (and there is no exit-page for any other discount)! A great price and this is an additional huge potential of making money … so click the banner below to skyrocket your business in any way! Additional Video available: YES, click here to watch! Click below to Share this Content ! Click below to Follow me ! » Google Sniper 2.0 Review - discover the Way of your Success with Online Marketing and follow this Way Step by Step - it is easier than you think! you will get a FREE Marketing-Pack INSTANTLY! IMPORTANT: Before signing up, please add my email-address admin@onlinemarketingproductreviews.net to your list of save senders, so that you guaranteed receive the download link. If you don't get my email, please contact me. Your private Informations will never be shared with anyone ! Proudly powered by WordPress | Copyright © 2019 by Online Marketing Product Reviews · All Rights Reserved | ASR Search Engine | Webmasters Do you want to have a Website like this ? Please email us here !